I hope you enjoy the short stories posted here, as well as the news about my books and the selected quotes — some funny, some profound– that you will find below. I’d love to hear your comments. Recently we posted our 140th story and zoomed past 16,000 views. Milestones! 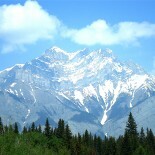 Photos: The photo at the top of this page was taken near Banff National Park. The background photo is of a cherry tree in full bloom . My photo was taken in Palm Springs by friend Dave White. While you’re here, please scroll down to a collection of quotes: some serious, some humorous, some profound. It’s a great pleasure to let you know that my newest novel, SECRET SHEPHERD, has just been released by my publisher, Solstice Publishing Inc., Farmington, MO. Its a gripping mystery/suspense novel tempered with lots of heart and soul. Tantalizing? Hope so! A single act of kindness plunges young philanthropists Paul and Anne Winston into jeopardy. After rescuing a gifted youth from an international drug cartel, the gang retaliates with huge rewards for the murders of them and their two children. And that was just the start of the wealthy couple’s troubles: Paul has discovered the drug boss is having an affair with Anne’s mother. Then it gets even worse … police forbid him from telling newly pregnant Anne about it, forcing Paul to break a solemn vow. SECRET SHEPHERD is the second in a series that began with THE MAIDSTONE CONSPIRACY, a gripping mystery awarded first place in an international reader’s competition sponsored by McGrath House in London, UK. It was selected by a panel of judges from among novels published around the world, to be among five finalists in the Contemporary Fiction category. Then the sponsor, McGrath House, invited the public to choose winners in each of nine categories and THE MAIDSTONE CONSPIRACY was chosen as the Best Contemporary Fiction novel in their 2017 contest. My debut novel, THE ULTIMATE THREAT, enjoys the rare privilege of being an Amazon bestseller twice. It first achieved that distinction when it was released in June 2015, and then made an encore as a #1 bestseller in early December, 2017. We’re not sure how that happened, but we’re delighted. The novel is about that scourge upon humanity called ISIS. It will be scary to some — hey it’s a thriller about those psychopaths — but the sales and the wonderful reviews have been heartwarming. You can check it out here: The Ultimate Threat. I’m delighted that it also placed second as Best Thriller of 2015 in an international readers poll in early 2016. Back to The Maidstone Conspiracy for a minute. It’s a story of passion and intrigue spanning the world, from the graceful beauty of the English countryside to the rugged grandure of the Colorado foothills. Writing this novel was great fun! Here’s the link, hope you’ll check it out: The Maidstone Conspiracy It also tied for third as Best Mystery of 2015 in the P&E poll. In between my first two novels, a collection of short stories called, ENCOUNTERS WITH LIFE — TALES OF LIVING, LOVING & LAUGHTER, was named Best Short Story Collection of 2015 in the open category in that P&E readers’ poll. It contains 34 of my short stories that I hope will inspire and amuse you, and warm your heart. Here’s the link to Amazon: Encounters With Life com. I’m delighted to also tell you about a great anthology to raise funds for a foundation helping families disrupted by war to get re-established. All proceeds from “Limitless” will go to the AMAR Foundation based in London, UK, under the patronage of Prince Charles. Two of my short stories were selected by the publisher and project sponsor, McGrth House, to be among 39 poems and stories from around the world included in “Limitless”. Here’s the link. The anthology was released in print and ebook formats in October. All poets and authors donated their stories. One of my stories is a personal favorite, Dragonflies and The Great Blue Heron, which is making its third appearance in an anthology. The other story is called Rein of Error, a never before published story about a tyrannical school teacher’s intolerance of a left-handed second grader. Dragonflies and The Great Blue Heron also made an appearance in a charitable anthology to raise funds for Canada’s branch of Doctors Without Borders. Voices From The Valleys is a collection of 50 short stories, edited by Jodie Renner of Penticton, BC, an internationally acclaimed author and teacher. Here’s the link: Voices from the Valleys. It’s encouraging to realize that my short stories now have been included in a total of nine print anthologies published in Canada, the Unites States and Britain, as well as numerous online anthologies and ezines. And just in case you need inspiration for next Halloween check out the scary anthology, Now I Lay Me Down To Sleep, from Solstice Publishing, which ironically accepted one of my funny stories about a Halloween prank that backfired: http://amzn.com/1625262728. It’s a pleasure also to let you know that two of my short stories have been published in another anthology called, Never Light a Match in the Outhouse: Funny Stories from Cottage Country. The book was published by Summit Studios and is available on Amazon: http://amzn.com/0986685666. Another of my short stories, The Salt Lick, published on this blog, was the runner up for first prize in a contest observing the 10th anniversary of the Word on the Lake writers’ festival. The Salt Lick was included in an anthology honoring the Festival sponsored by the Shuswap Association of Writers. was a finalist in a competition sponsored by Tales2Inspire. Another short story entered in the same competition, Barbara’s Story, an intimate true life love story, received an honorable mention from the Tales2Inspire judges. My working career began in journalism and then teaching journalism, after which I took a detour through the corporate world before returning to writing. That detour included becoming vice-president of a Fortune 500 company — a mixed blessing — and then president of a management consulting firm for 10 years. Those experiences made clear that a varied life, filled with a diversity of mostly good and occasionally not-so-good experiences, provides a huge resource for creative writing. Have a terrific day. You deserve it! “We all need people in our lives who raise our standards, remind us of our essential purpose, and challenge us to become the best version of ourselves. Religion is the arrogance of assuming things that you do not know. It ain’t what you don’t know that gets you in trouble. It’s what you know for sure that just ain’t so. On Grief: Most people understand grief as an event, not as the permanent alteration to life that it is, and so they stay until the funeral and imagine that when the service ends, that somehow you too can move ahead; that there is some finishing to your mourning. If you have been brutally broken but still have the courage to be gentle to other living things, you’re a badass with the heart of an angel. Your reputation is what you’re perceived to be. Your character is what you really are. Survival of the fittest has less to do with being the strongest or the most intelligent, and almost everything to do with being able to adapt to change. I feel no need to be what you think that I am. My choices in life were either to be a piano player in a whore house or a politician. And to tell the truth, there’s hardly any difference! The secret to a good sermon is a good beginning and a good end, and as little between the two as possible. O would some power the gift to give us, to see ourselves as others see us. When the white missionaries came to Africa they had the Bible and we had the land. They said ‘Let us pray.’ We closed our eyes. When we opened them, we had the Bible and they had the land. Bozone — A layer surrounding stupid people that prevents intelligent thoughts from coming through. Source: Washington Post annual Mensa create-a-word competition. 1. Imagination is more important than knowledge. For knowledge is limited to all that we now know and understand, while imagination embraces the entire world, and all there ever will be to know and understand. 2. The significant problems that we have cannot be solved at the same level of consciousness with which we created them. 3. The world will not be destroyed by those who do evil, but by those who watch and do nothing. Einstein once defined genius as the ability to recognize the obvious. It’s not hard to see why. Trying to blow out someone else’s candle will not make yours shine any brighter. Seeing clearly sometimes means opening more than our eyes. You will have become a mature adult when you have learned to forgive your parents. By then you will understand they did the best for you that they knew how at the time. Writing is an adventure. To begin with, it is a toy and an amusement. Then it becomes a mistress, then it becomes a master, then it becomes a tyrant. The last phase is that just as you are about to be reconciled to your servitude, you kill the monster and fling it to the public. The very best writing invites you in so completely that you become unaware you are reading it. Religions that are mad or sad and not glad, are bad. Everyone is born with certain abilities, but it is with the ‘nourishment’ of parental guidance first, and then of other life experiences, that these inate endowments will flourish. The older I get the more it becomes clear that fewer and fewer things in life are as important as I once thought. A writer’s work looks quite different from the inside out than it does from the outside in. Racism: White supremists and neo-Nazis are bullies, recognizable by their stunted emotional development and inferiority complexes. This does not excuse their behavior, however these two debilitating character flaws make them extremely dangerous, just like other uncivilized creatures that become vicious when threatened. About Donald Trump: This man appears incapable of resisting the temptation to humiliate himself, and to make himself and his country the laughing stock of the world. On Canada and Being Canadian: Who we are as Canadians lies precisely in the delicious reality of not being defined or definable, especially by others who would seek to describe us in ways that would define themselves. For much of my eight decades on this planet there has been a succession of those (who ought to know better) who prattle on about the need to define Canada and what it means to be Canadian. That discussion never was necessary, and today is manifestly tiresome. A peculiar feature of democracy is that once we’ve elected someone to office, many among us thereafter choose to vilify the person(s) we have chosen to represent our interests, frequently doing so with a deficit of factual information about their performance before or after taking office. The consequence is that many accomplished people who we ought to choose to lead us, quite rightly decline exposing themselves and their loved ones to the abuse and falsehoods we heap upon those in public office. Such behavior places democracy at risk, and is unbecoming to us as responsible citizens. Free speech should never be considered a license to utter criticism, or falsehoods or misinformation that is not substantiated by fact. Those who chose to do so reveal more about their own shortcomings than about those they would demean. It is so much easier for a person to criticize that which someone else has accomplished than to demonstrate how they could do it better. Sometimes the answers to perplexing problems lie not in our capacity to invent solutions, but in our ability to recognize answers that lie within our reach. Those who bear a grudge carry the heaviest burden. Celebrate differences, for therein lies the genesis for much that we will learn in life. With a book in hand, you are never alone. The real measure of a person’s worth is not in what they own but in how they treat themselves and others. About the Monarchy in Canada: Most Canadians seem to view HRH & Co. as something of an historic anachronism likened to a harmless old aunty we occasionally invite to family events. The fact is that precedent over the years has relegated the monarchy in Canada to a largely ceremonial role. We can blame all sorts of ills on the monarchy should we feel compelled to do so (mostly sins of the past), or we can take a more constructive view by appreciating the value of the positive international attention the younger royals have drawn and are continuing to draw to good works around the world today. Bottom line: those who feel oppressed by the monarchy — or by anything/anyone else for that matter — are indeed oppressed; those who do not feel so, are not. Literary Agent Sara Megibow once worked for an agency that in one year received 36,000 queries from aspiring authors. From among those, the agency requested 839 partial manuscripts, considered 98 full manuscripts, and from all of those signed just nine new clients. Evidently, huge odds are not confined to lotteries. Looking good Jim! Will be looking forward to seeing updates as well. boy, those are quite some daunting numbers. Nice blog. Visiting after your helpful comment to me on linkedin about publishing posts from blogs. I love your blog site, James. Well put together and I can appreciate the work that must have taken. Just subscribed and looking forward to your posts!! The site looks good, James. keep up the good work! Nice blog, James–good luck with your books! Looking forward to “following” your website here and checking out your books. Best of luck to you! Hi! Your blog is wonderful. 🙂 I really like the quotes you’ve posted too. The one By Albert Einstein is my favorite! I’m off to check out your stories. James, I’m so glad I wandered over to your blog from LinkedIn! You write with a happy, insightful tone, and I love it. Your famous quotes are telling, too. Pithy sayings are so spot on sometimes, aren’t they? Thought I’d drop in and have a look-see. A pleasure to meet you. Hi Jim, nice to see your web presence! It was good to meet you tonight. Thank you so much for contacting me via my blog, Apologies for the delay in getting back to you. I’m currently snowed under with requests to do book reviews. I’m also about to start the process of self publishing a collection of my own short stories. Once the book is published I’ll hopefully have much more time to do book reviews, so please do keep me in mind. I’m meeting Olga at a Bloggers Bash in few weeks time and I’ll mention to her that you’ve been in contact. The very best of luck with your writing and books. Best wishes with you short story collection. Best regards to Olga. Fabulous lady! I like the look of your blog James nice to find you today via Winnie the Pooh! Thanks Marje, and welcome! Hope you find time to some explore my blog. Welcome aboard! Hope you enjoy the stories you’ll find on my blog. They’re mostly light-hearted/feel-good stories, like Winnie’s story. I’d value your further comments. 13 thousand? Well done, that man. I wish you continuing success ! Hi Andy. It surprizes me, for sure. We’re closing in on 14K now. Keep you posted. BTW: If you scroll down, you might enjoy some of the quotes I’ve collected near the end.